Henna is mentioned only twice in the Bible, both in the Song of Solomon (or Canticles). The Shulammite girl describes her beloved. Scholars are divided about the meaning of the Hebrew term used here. Is this woman named Shulamith? Is she from the Jezreel Valley town of Shunem? Is she described as “the Perfect One” (NET Bible)? Or, is there some other plausible explanation? Tristram mentions finding the “camphire of Engedi” at the site (cf. KJV transliteration of the Hebrew kopher). The camphire of Engedi, mentioned in the Book of Canticles, we identified in a pretty shrub, with bunches of graceful pink-white blossoms, which was already in flower in some sheltered nooks, and called El-Henna by the Arabs, from which they procure the Henna dye—the Lawsonia alba of botanists. (The Land of Israel: A Journal of Travels in Palestine, Undertaken With Special Reference to Its Physical Character, 294-95). 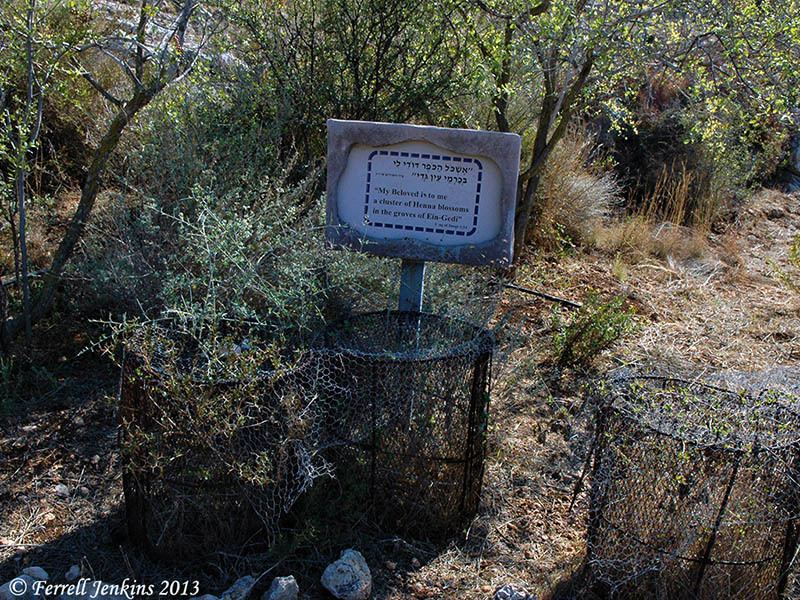 Some small plants identified as henna can be seen at Neot Kedumim in the low hill country between Modi’in and Tel Aviv. Both they and the Fauna and Flora of the Bible identify it with the Lawsonia inermis. I don’t know how to sort out this name and the Lawsonia alba that Tristram mentions. Henna growing at Neot Kedumim. Photo by Ferrell Jenkins. Henna is used by women of many societies on their hands, and other parts of the body. In several places I have seen local women painting designs on those who wished to try it. 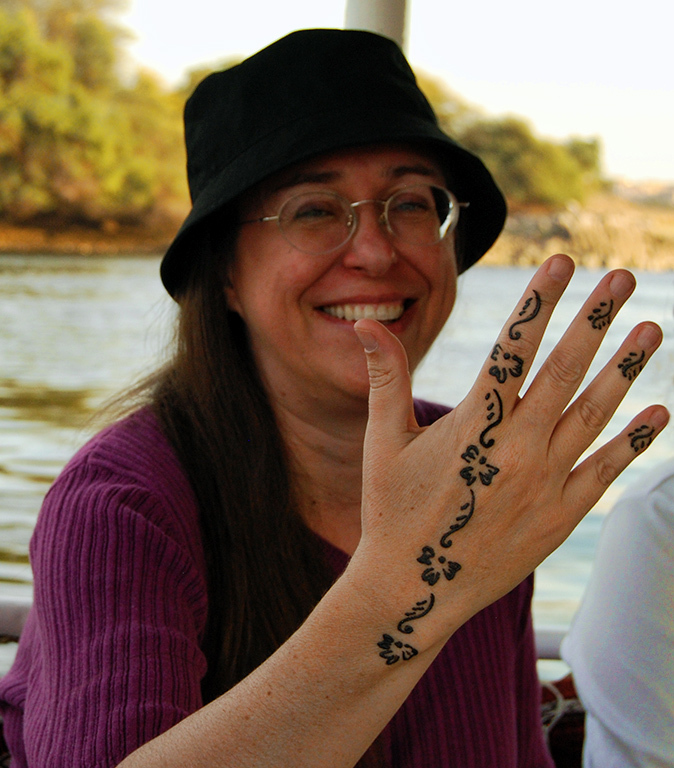 Stacy got henna tattoos from a Nubian lady in southern Egypt near Aswan. She says it lasted about three weeks. Photo by Ferrell Jenkins. This entry was posted in Bible Places, Bible Study, Culture, Egypt, Israel, Old Testament, Photography, Travel and tagged Canticles, fauna and flora, Henna, jezreel valley, lawsonia alba, lawsonia inermis, tattoo. Bookmark the permalink. Thanks for reminding me of that very important fact.